We are comfortable with all design styles, from rustic log homes to beachfront cottages, from traditional to contemporary. We innovate in all environments. Every home tells a story. Our goal is to transform individual spaces in your home into an overall style that reflects your individual character and provides you with the comfort and happiness that people have found in Muskoka for generations. Thanksgiving is a magical time to spend at the cottage. The leaves are in full colour, the air is crisp, bonfires and woodstoves are lit and quieter roads make the journey there and back a breeze relative to busy summer weekends. September used to mark the end of cottage season, when deck chairs were put away, water was turned off and farewells were made until the spring. 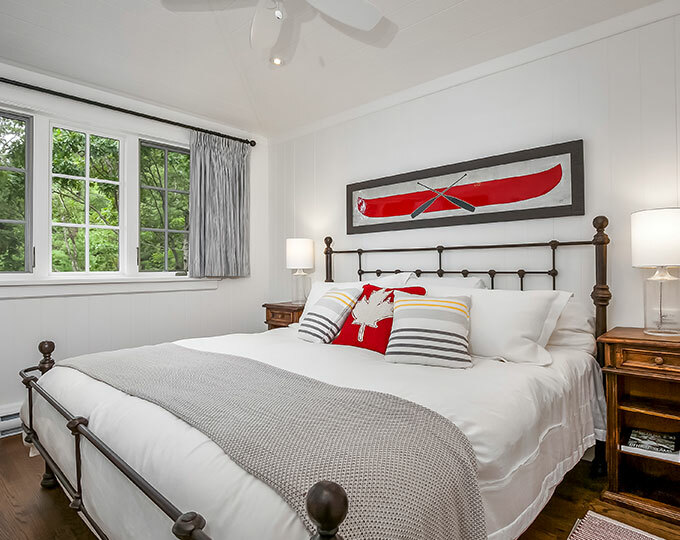 But for more and more people, cottage season now extends well into October, with Thanksgiving celebrations standing out as a quieter, more relaxed opportunity to enjoy the company of family and friends and give thanks to your cottage as a space that rejuvenates you and your loved ones. Thanksgiving is all about enjoying experiences and awakening your senses. Think drives down country roads to see the colours, long walks with family, time around the bonfire looking up at the night sky and hosting gatherings around a table to enjoy a delicious meal. When it comes to decorating your cottage for Thanksgiving, it is the easiest time of year to decorate with natural touches. It’s also a great time of year to shape your decor around experiences for your family and guests to enjoy. Here are a few ideas. Bring nature indoors. Go for a walk with family to cut bulrushes and cedar boughs. Bring them home and put them in a metal bucket by your front door to welcome guests. The contrast of green and brown is beautiful and perfect for the season. Pine can sometimes be easier to find, but look for cedar as it will last longer indoors. Keep warmth nearby. A basket of wool blankets and throws looks beautiful, and also comes in handy when everyone wants to cozy up inside or outside. Make the table a centre of attention. Thanksgiving is all about enjoying a great meal with family. Make the table and surrounding space a focal point with seasonal decorations. These can be natural, or come by our store for ideas. Prep your cottage for an extended season. With cottage season now pushing well into October and beyond, there are many ways you can make sure your cottage is well-prepared for an extended season. For instance, outdoor furniture made from recycled plastic is more durable and holds their colour better than wood. Enjoy Thanksgiving at the cottage. Take your time, cozy-up in a sweater and blanket, savour the colour and celebrate all that is good in life. If you don’t have a cottage, many resorts offer Thanksgiving meals and activities that make it easy for everyone to enjoy cottage country during a wonderful time of year. Copyright © 2019 HillTop Interiors.